Hey Tom, whatever happened to your recipe blog? Well, the old one is out there somewhere, but heck if I know where. In the spirit of moving on, I will just post new recipes here. This salad was inspired partially by something we had at Agava Restaurant in Ithaca, and partially by a big pile of organic kale that we got on sale. The kale is salted to soften it, but otherwise raw. Take 1 bunch fresh kale, remove stems, wash and coarsely chop. Rub in (make sure it really gets into the kale) one tbs. salt and let stand in bowl or colander for 20 minutes, or until the vegetables have shrunk down to about half their original size. Rinse with cold water, while squeezing out any additional liquid. Set aside. 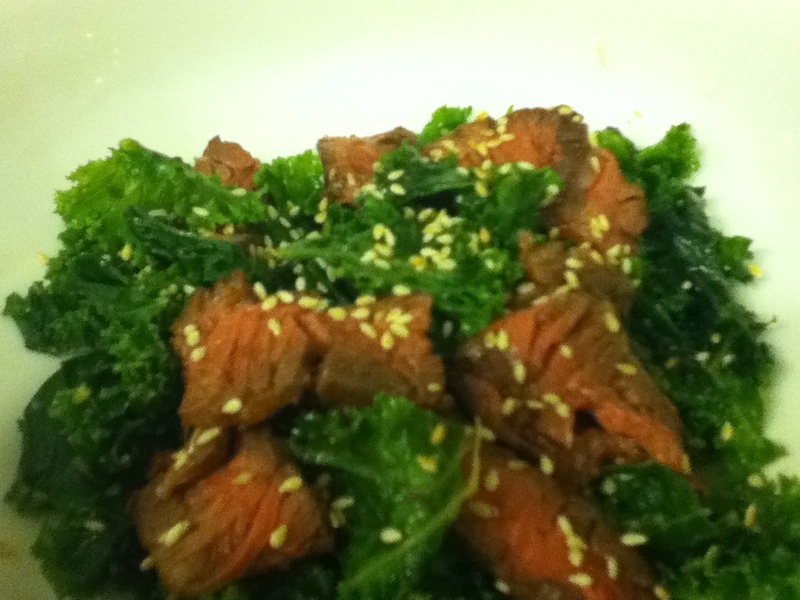 Mix the dressing and toss with wilted kale, and top with roasted sesame seeds. Could also add kombu kelp, sliced Asian pears, or thinly sliced raw onions. Top with thin slices of grilled beef – use a nice strong tasting cut like hangar or skirt steak, grilled rare and allowed to cool.